This article explains how you can extract an excel report across multiple boards. Sometimes you need to (non planning) statistics across multiple boards, for example to report on the financial status, board pipeline status, etc. When you want to report on the card progress and planning status, you can create a report or dashboard in Placker, in case you want to extract custom attributes, there is no way to do this. You will still need to process the values into a formatted report but at least there is a way to extract the values across your boards. Let's say you want to report on three attributes (attribute 1, attribute 2, attribute 2), across multiple boards (Board 1, Board 2, Board 3). On each board you create a list 'Report' that has a card for each of the attribute, the card title holds the attribute value. Then go to export cards to generate an excel file from these cards. 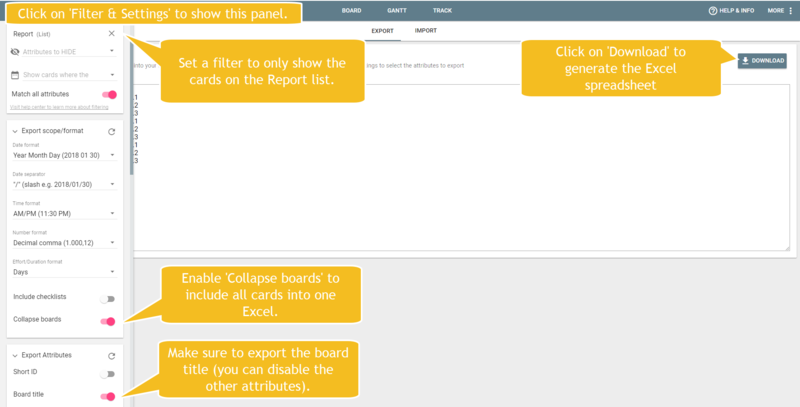 On this page set a filter to show only the cards in the report list, add the board title in the export and collapse the boards to generate one file. Then click on 'Download' to download the excel file. The generated excel file will contain the list of attributes for each board, you will need to process this data in your own report but at least you now have a way to keep collect this information across your boards. 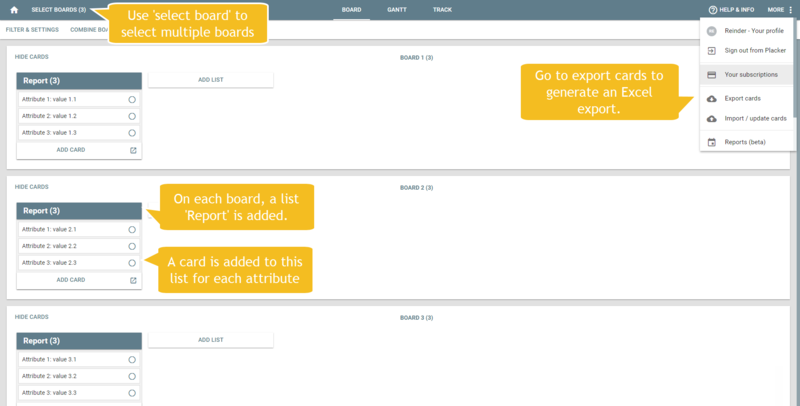 When you want to generate a report on the card status across each board, you can use the dashboards and reports available in Placker, this article describes how to retrieve attributes not related to the planning.